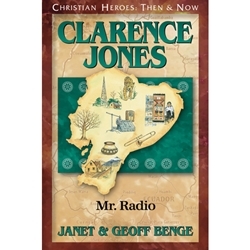 Returning to Radio HCJB, Clarence (1900-1986) brought up the rear as the men rode in the dark along the narrow horse trail carved from the mountainside. Suddenly Clarence's horse stumbled and slid over the trail's edge, taking him with it. As horse and rider fell toward the canyon floor one thousand feet below, Clarence was not even able to scream. Although born into a devout Christian family, Clarence Jones wasn't interested in religion. It was this Midwesterner's ear for music that led him to play trombone at Chicago's Moody Church, where he gave his life to Christ and volunteered for mission work. Clarence's work began in Chicago, where he helped pioneer something unheard of-Christian radio broadcasts. Soon God called Clarence to "go south with radio." Led to Ecuador, Clarence worked unswervingly to cofound Radio HCJB and the World Radio Missionary Fellowship. His legacy of broadcasting the gospel to the ends of the earth soars on the airwaves today.